Last week bad news hit the Cincinnati Reds organization when Nick Senzel tore a tendon in his finger that would require surgery and end his 2018 season. It was a tough blow for both Senzel, and for the Reds organization. You never want to see injuries happen. But sometimes when they do, it opens up an opportunity for someone who may not have otherwise gotten a chance. In this scenario that player could very well be Dilson Herrera. After having shoulder surgery last summer, and struggling initially in spring training, the Reds designated Herrera for assignment in March. He cleared waivers and the Reds sent him to the minors. He would begin his season in Daytona in the Florida State League. The first month of the season would see Herrera stick around with the Tortugas, hitting .298/.359/.429 in 21 games played. The league average OPS in the Florida State League is just .694 this season. Dilson Herrera was sent to Triple-A Louisville early in May. He got out to a slow start, hitting .256/.299/.390 with 4 walks and 21 strikeouts in 23 games during the month with the Bats. He’s got a long history of hitting in Triple-A, but May was one of his worst months at the level. June, however, has been one of his better months in Triple-A. Over 20 games played with the Bats this month he’s hit .356. That’s also come with 14 walks, giving him an on-base percentage of .461. He’s also had seven doubles and a home run during the month, good for a slugging percentage of .493 – giving him an OPS of .954. Overall he’s posted an .819 OPS in 43 total games in the International League. It’s been several years since Dilson Herrera was eligible for prospect lists. He spent too much time in the Major Leagues with the Mets to still qualify for them over the last few years, but when he was last eligible, he was considered a Top 100 caliber prospect. He’s still just 24-years-old. The biggest issue, at least in terms of fitting in with the Cincinnati Reds, is that he plays second base and the belief is that if he’s ever going to be a starting caliber player, it’s going to have to come at second base. 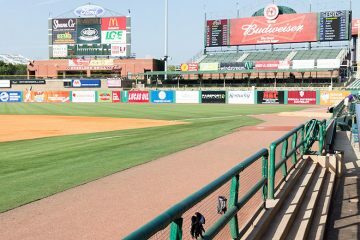 In Louisville, with Nick Senzel on the same team, Dilson Herrera was spending time at third base. Every so often he would play at second when Senzel would slide to third – but that was maybe once a week. With Senzel now out for the season, that is going to lead to Herrera playing second base nearly every day. And it may also mean that without Senzel taking a spot on the big league roster in the latter half of this season, that spot could possibly go to Herrera if he continues to perform. If the Reds do decide to bring up Dilson Herrera they will have to believe he’s going to be up for good. He’s not currently on the 40-man roster, and once he’s added he will be out of options and be unable to be sent back to the minors without exposing him to waivers. He’s also a free agent after the season is over if the team does not add him to the 40-man roster. There are a lot of things going on in regards to Dilson Herrera. The first is the 40-man roster spot that he doesn’t have. The second is the options issue. The third is that there’s not exactly an opening in the big leagues at the position right now, either as a starter or on the bench. That could be the biggest thing. Scooter Gennett is killing the baseball right now. He’s been killing the baseball for the last 15 months. But he’s also a free agent after the 2019 season, and that puts the Reds in a situation where there’s plenty of debate: do you trade him, keep him for now, or try to extend him? Without getting into the merits of each, a trade could open up a spot – at least in the short term, could open a spot for Herrera if he continues to perform. How things play out will be interesting to watch. The first thing to keep an eye on, of course, will be the performance of Dilson Herrera. But after that, what the team does with Scooter Gennett up to July 31st. If that date comes and goes without a move, then the next time to pay close attention will be in September when the team begins their end-of-the-year call ups. There’s also a small chance that the team could go without adding him to the roster for September, but would add him right after the season ends in order to keep him in the organization rather than let him enter free agency. God knows, with all his injuries, Herrera’s opened up plenty of opportunities for others. Hate it for Senzel, but can’t wait to see DH in the majors. I have no doubt he can hit and the guy made the Mets roster as a 20 year old. If his shoulder is finally healed you have to get him on the 40 man to avoid losing him. I just don’t know where he plays. There has to be a trade or two made, and maybe some guys taken off the 40 man. I looked over the Reds 40 man roster, and there are a couple of pitchers on there that make me go….meh. But really, Phil Ervin is a guy that does not have a lot of practical value for the Reds. He has never matured into the hitter that they hoped he would be. There is a whole phalanx of younger outfielders coming. And if Scooter is made into and outfielder, the whole thing gets more crowded. Phil Ervin is the odd man out. Make room for Dilson. He needs to get up here and play to see what he has. I understand he played in Florida early in the year because of warm weather and healing his shoulder. Then came up to Louisville, and has started hitting well (as expected). I always thought he should be up here BEFORE Senzel, just because he is out of options. If the Reds do nothing, they will probably lose him. 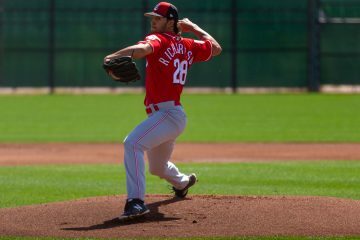 With internal guy Shed Long coming up on Herrera’s heels, the Reds need to be figuring who among the 2B prospects, including Nick Senzel plus Scooter if he re-signed can be deployed elsewhere and how that impacts their planning for other positions. This is a new situation for the Reds. They need to be able to figure out for instance might the Reds be a better team in 2020 and beyond with one of these 2B guys in LF and another at 2B versus one of them at 2B and another traded or on the bench, instead of thinking only in terms of guys being an IF or an OF. They need to get away from the ‘we’ve got Jack (or Jesse or Scott et al) for that” mode of thinking and look to put the 8 guys on the field that give them the best all around team. Dilson Herrera is 24 and won’t be 25 until next March. He had 103 PA’s for the Mets in 2015 as a 21 year old, the year the Mets went to the World Series. The Reds put Herrera on waivers at just the right time and were lucky to keep him. That has worked out well so far. However, it seems like the Reds have to jump through a few hoops in order to get and keep Herrera up on the ML roster once he is there. The way Herrera has played this year, it makes him a very nice add-in on any trade talks the Reds will have coming up. I think that is where Herrera’s most value comes with the Reds, as a good trade chip. It is just a shame that it looks like Herrera and Long cannot play any CF. If Herrera could have played CF that would have solved 2, maybe 3, issues. Herrera is like that man without a country, he is a man without a position to play. I’m still surprised Herrera made it through waivers. I understand, with the shoulder concerns, but to pick up a guy like that for free — hard for me to believe 29 teams passed on that. Agree… maybe a nice trade kick-in. Does he project to be able to play corner OF? How was he at 3b?